How balanced is your training program? What about time management? Do you pace yourself, and give enough time to recover in between sets, or perhaps spend too much time socializing with other gym goers? This is why keeping a training journal can be most helpful. Workout logs are beneficial for beginners as well as seasoned lifters. I’d say they are essential if you are serious about achieving your fitness goals. Motivation. Looking back at where you come from is inspiring. Awareness. You get an understanding of what works for you. Training logs provide accountability, progress, and motivation for your training sessions. Experience. You learn from your errors: injuries, etc. Confidence. You’ve got a plan when you go to the gym. The process of writing down your loads, sets, reps, etc. helps you to better remember the workout. It’s nice to be able to flip back and see what weight you used and how many sets and reps you did. The process of keeping a log enables seasoned lifters to critically analyze their programs and see if they’re truly delivering results. Also, use your log to jot down important notes such as machine settings, how the set felt; (light, heavy), how you felt that day (energized, fatigued, hungry, sore). Keeping a journal accelerates the learning process. By writing down your workouts you are taking an additional few minutes to process what you have learned, repeat the concepts and terminology to yourself, and ingrain it into your brain. If you are a beginner it is likely you will be able to beat previous efforst every week for several months. As you establish new routines, it is helpful to know what you did your previous workout and to have a specific goal for each training session. Logging workouts helps you remember the appropriate weights to use. Beginners struggle most with remembering not only which exercises to do, but in which order, how many sets, reps, etc. because everything is new to them. They’re not yet familiar with the names of exercises, the loads they used, etc. so training logs for beginners are essential. I have been journaling for several years now and still write notes in the margins to remind me of proper set-up and/or form on certain exercises. Tracking results and being able to check your progress lets you know if what you’re doing is or isn’t working. If you make notes about your workout, you are also less likely to spend time chatting between sets or resting too long. Seeing your gains on paper will reaffirm that you are progressing, and as a result motivation will likely increase or stay high. Do you Train your Brain to be as Tough as your Body? Some may argue that toughness is found in soul, spirit and mind… and not in muscles. Never underestimate the power of your mind…whether it is in sports, in business or in life. Becoming mentally stronger may be the one factor that determines whether you realize your goals; or not. It may be the one single factor separating you from being a champion or a runner up. When life gets hard, we tend to want comfort, not change. Those who have learned the secret to mental toughness have learned that comfort now may mean pain later, but a little pain now can yield great rewards in the future. Learn to bounce back from adversity, pain, or a disappointing performance. Realize and admit a mistake, understand a missed opportunity, embrace the lesson and quickly move on and refocus on the immediate goal ahead. Focus in the face of distractions and unexpected circumstances. Don’t avoid situations or make excuses for less than perfect conditions. When your are dead tired, hurting and want to quit is the time to dig deep and focus. Tell yourself to keep moving forward. Have faith in yourself Trust that your body will know what to do when it is time to perform. Trust in your training and your plan. Trust in your coach. Believe in yourself, even if there is no one nearby to boost your confidence. The human body is built and rebuilt everyday from and by proteins. Eat protein with every meal. fats) This is one reason why high protein, low carbohydrate diets are popular for those attempting to lose weight and build muscle. And protein does a better job of filling you up and keeping you full longer than carbohydrates or fats. muscle and conserve protein for basic, life sustaining needs and may not perform other duties such as healing and immune function if protein intake is not sufficient. Protein Shakes make an excellent snack or meal replacement. Proteins are found in all varieties of foods; however, some forms of protein are more healthful and beneficial than others. Choose foods that are complete proteins and do not contain high saturated fats or sugars. Fish and poultry are excellent choices of high protein foods, as are foods in the legume family including: beans and lentils. Eggs, cottage cheese, yogurt (and other dairy); as well as various nuts and seeds are also protein rich choices. Red meats contain a great deal of protein, but take care to choose lean cuts of meat, avoiding the extra fat. A Whey protein shake makes for excellent snack or a meal replacement for those trying to lose weight. Most protein powders mix easily with milk, water or juice and will quickly add 25 or more grams of protein a day. And shakes are easy to make and very portable, making it simple to get your protein on the go. Here is a “recipe” that combines 3 of my all time favorite flavors: Chocolate, Coffee, and Coconut! Blend all ingredients for 1-2 minutes in a personal blender : AWESOME!! Empower and Challenge yourself with Push-Ups!! Because sometimes the most basic exercises are the most effective. Push-ups are among the all-time great total body workout exercises. They incorporate the triceps, shoulders, chest, abdominals, back and core. They can be made easier or harder. They build strength and stamina. They force the heart to work harder and the blood to pump faster. This increases metabolism and helps you burn more calories. And, they can be done anywhere, anytime, by anyone regardless of fitness level. No space?… No equipment?… No time?… No Problem. Decline Push-up on Stability Ball -For added core stabilization and tricep involvement. something lower as your strength increases. Once you build up arm and core strength, “graduate” to the floor, and begin by holding yourself up in a plank position with your chest off the ground. Start on your knees, with hands wide. (Wider is easier). Don’t worry if cannot go full range yet. .. In time you will. In addition to building upper body strength and gaining more power in the arms, shoulders and hands, pushups done with the proper form will help build the core muscles in the middle of your body. To do pushups properly, your elbows must be fully extended at the start and end of a pushup, your toes should be on the floor and your legs, hips and back should be straight. There are dozens of variations of push-ups out there. If you find that push-ups put strain on your wrists, try placing your hands on a set of dumbbells (or a push-up bar) to keep your wrists in a more neutral position. According to Oxygen Magazine author Pam Mazzuca, performing pushups in this manner also increases core activation as well as engagement of the back, triceps and rear deltoids. Push Up on Dumbbells to reduce strain on wrists. By altering the angle that you perform push-ups, you also change the emphasis of the muscles worked. Doing pushups with your feet on an incline work the shoulder and upper chest muscles a little bit harder than a standard pushup does. If you really want to challenge yourself, place your feet on a stability ball instead of a stationary object. This forces you to balance your body at the same time that you’re working your pushups, offering a tough variation. Incorporating an unstable, movable surface such as a medicine ball uses more core strength, increases difficulty of the exercise and engages more core and triceps. As you continue to progress try: plyo, staggered, deficit, diamond, handstand pushups… just to name a few . Start your own push-up challenge today and watch as you impress yourself as you gain not only strength but confidence! Working out with weights will not cause joint pain. Improper technique, insufficient rest, or poor nutrition might be contributing to your grief. Joint pain is one of the most common problems among strength athletes. It’s something younger lifters rarely think about when lifting and too many seasoned lifters wish they had when they are forced to stop lifting due to years of stress on joints. Joints require mobility, stability, and motor control. Proper weight training has been found to improve joint health, return functionality and decrease pain. Regular exercise of the joints replenishes joint lubricants and builds cartilage. Stronger muscles from weightlifting exercises offer more support to the joints. ü Insufficient warm-up prior to lifting. What's the cause of your joint pain? ü Insufficient rest/recovery time to allow joints, tendons, muscles to recuperate from intense work. ü Inadequate vitamins and nutrients. ü All of the Above. So let’s say that you are not guilty of the above 7 mistakes but still experience joint pain. It could be bursitis, tendinitis, arthritis or the like causing aching joints. ARTHRITIS: Osteoarthritis, by far the most common to bodybuilders and athletes is caused by wear and tera on the joints. It is characterized by a deterioration of the cartilage at the ends of the bones. The once smooth cartilage becomes rough and causes more and more friction and pain. BURSITIS: Joints contain small fluid filled sacks called bursae. The bursae assist in muscle and joint movement by cushioning the joints/bones against friction. Inflammation from various causes (See above 7 mistakes!) results in a chronic pain called bursitis. TENDINITIS: Tendonitis occurs when tendons around a joint become severely inflamed from overuse, micro-injury, etc. It is probably the most common cause of pain to bodybuilders and other athletes and also the easiest to treat. But if left untreated, as when people just try to “work through the pain”, it can lead to much more serious problems. Many medications like non-steroidal anti-inflammatories, or treatments like cortical steroidal injections, address only symptoms and not the cause of the problem. In fact, research has shown just the opposite; by merely masking symptoms, they may do more harm than good in the long run . And the ever popular “stay off of it “ advice just does not fly with highly active people. The good news is that natural compounds and other dietary supplements may be helpful in supporting joints before, during and after lifting sessions. If you are a lifter, joints require optimal nutrition to help you perform and recover. GELATIN: A growing number of studies now show that just 10 rams of hydrolyzed gelatin a day is effective in greatly reducing pain, improving mobility and overall bone/cartilage health. 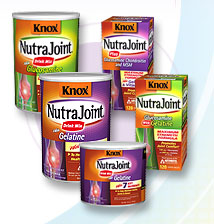 Knox (the Jello people) have a product out called NutraJoint. It contains hydrolyze gelatin, calcium and vitamin C.
Diets rich in Vitamin C, D, and Calcium are important for optimizing joint health. FLAX OIL: (Omega 3 Fats.) One of flax oils many, many benefits are those to improve overall joint health. Flax oil is high in essential Omega 3 fatty acids. Omega-3 fatty acids, from fish, flax, etc., have been shown in scientific/medical literature to reduce chronic inflammation of any kind. The recommended dose is 1-3 tablespoons/day. Boost your intake with fatty fish (tuna,salmon,etc. ) walnuts, and flax. If you can’t get it through food, supplement with 1-3 g of EPA/DHA per day from fish oil. WATER: Drink more water. Water helps to lubricate the joints. Aim for ½ – 1 oz per pound of body weight per day. Or at least aim to drink 5-6 20 oz bottles of water per day. FIBER: Focus on high fiber foods, and whole grains with at least 3g of fiber per serving. Fiber controls blood glucose and therefore helps to control inflammation. GLUCOSAMINE/CHONDROITIN SULFATE: Researchers have found both effective for promoting joint health . Found in the body naturally, glucosamine is a form of amino sugar believed to play a role in cartilage formation and repair. Chondroitin sulfate, on the other hand, is a large protein molecule or proteoglycan that gives cartilage elasticity. Numerous studies have shown that regular use of glucosamine and chondroitin sulfate offers pain relief similar to that offered by anti-inflammatory drugs, such as ibuprofen or aspirin, but minus the gastrointestinal upset that may accompany long-term use of these medications. A daily dose of 1,200 mg has been shown to reduce joint pain. It is never too early to take good care of your joints so that you are able to work out longer and more importantly remain pain free. Always begin your workout with range-of-motion exercises or an aerobic warm-up . Lift with perfect form. Ice your joints following exercise to reduce pain and swelling. Joint pain should not go untreated. Don’t try to self diagnose. Be sure to get an opinion from a trusted sports doctor first to determine exactly what your problem is. Healthy eating doesn’t really take any more time than unhealthy eating; it just requires a little more foresight. Everybody has a story about when or why they gained weight, or why they have no time to eat right. When you’re constantly on the go, it can be hard to find time to eat, let alone eat healthy. So you turn to quick-fix foods that are high in fat, sugar, sodium, or calories, and low in essential nutrients. But eating is what gives us the energy to do everything on our to-do list. And when we are busy and “forget” to eat, or hurriedly rush into the nearest convenience store or hit up a vending machine for chips and a coke, we are not fueling bodies. So how do you find balance? The solution isn’t to find more time, but to work with the schedule you do have. Instead of waiting in the fast food drive in line, use this time to visit the grocery store, and pick up prepared salads, sandwiches, and meats, pre-washed and cut fruits and vegetables, canned soups, low-calorie and low-fat frozen meals, yogurt, string cheese, and cereals. To lose weight, and keep it off you must eliminate foods that aren’t healthy and eat foods that are good for your body. 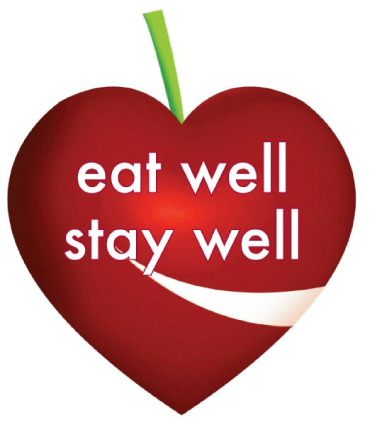 There is a strong correlation between how and what we eat and being well. People hold on to the illusion that there is no time to cook, no time to shop, and no healthy options for “fast food” meals. But just because there is no time to always sit down and eat, does not mean you have to eat poorly. What it boils down to is being prepared and carrying healthy snacks with you. Healthy Fast Food...or is it Healthy Food Fast? Cook a bigger batch of food on the weekends, and refrigerate or freeze for weekday lunches or dinners. Set an alarm for mealtimes. Even if you’re buried in work, don’t skip meals; designate a time to eat. Try not to do anything else while eating. Mindless consumption prevents the enjoyment of food. When that happens, people tend to eat more and eat unhealthy alternatives. Put fresh or dried fruit where you can see it to remind yourself of your goal to eat healthy. Bananas, grapes, and apples make handy and nutritious snack items. If at a restaurant, turn down the supersize option, and choose baked and broiled instead of fried. Order the lunch portion at dinnertime, and hold off on fatty condiments. with you for a quick protein snack or for breakfast on the run the next day. Fresh fruit protein smoothies are also quick, nutritious and satisfying. They are so versatile… almost anything goes. And they travel well. 1 scoop of Whey adds approximately 25-30grms of muscle building protein for satiability. I recommend buying one of the many personal blenders on the market like the Ninja or Magic Bullet. Mix and go, in under 2 minutes. Planning healthy meals and snacks ahead of time is especially crucial for people with junk food cravings. If you must have junk food, give the healthier alternatives, such as baked chips, dried fruit, or sugar-free Popsicles a try. Look for low-calorie, low-sugar, and low-fat options. In place of chips, try light popcorn, whole grain crackers, carrot sticks, red peppers, and rice cakes. For the sweet tooth, sugar-free pudding, sugar-free Jell-O, fruit bars, baked apple, fresh fruits, and dried fruits are options. If you put your mind to it, you can come up with your own ideas for eating well with little cooking. It’s just a matter of wanting to find solutions. Feed your Metabolism with Food. All Calories are not created equal. Contrary to what you may have been told, the body does not burn and store 500 calories of fruit and veggies the way it does 500 calories of refined, processed or fatty foods. Some foods take more work to eat–and therefore burn more calories while you’re digesting them. Just the act of chewing foods like fruits, vegetables, whole grains, and lean cuts of meat can increase your calorie burn by up to 30%! On the contrary, many other foods lack certain nutrients and minerals that have been proven to stimulate the metabolism. The higher your metabolism level, the faster you will lose weight, provided you eat healthy food and pursue an active lifestyle. Depriving your body of fuel is a surefire way to slow it down. When you slash calories, the calories burned by eating are greatly diminished and so is your metabolic rate. Restricting calories also signals the body that there is no food available, so it tries to conserve stores of carbohydrate and fat by slowing down its metabolism. The best way to keep your metabolism revved is to eat regular meals with snacks when necessary to give your body a constant supply of healthy fuel. There are proven nutritional superstars that can fuel your metabolic fire and help you to burn more calories as you kick your diet into high gear. These foods/beverages act similar to the way a thermogenic or a cardio session in how they affect the body. They can ramp up your metabolism, and in essence, assist you in burning fat. When you wake up in the morning it is especially important to “break the fast” (and a sleepy metabolism) by eating breakfast. When you eat breakfast you start burning calories earlier, thereby burning more total calories through the day. And keep your metabolism pumping all day long, by eating several small meals through the day. You will tend to eat less at one sitting, which puts less burden on your digestive system and lets it work more efficiently. So what are you waiting for? Let’s get your metabolism moving! 1. Oatmeal If you’re looking to jumpstart your metabolism, start your morning off with a bowl of oatmeal. This super food is rich in fat soluble fiber, which requires a lot of calories to break down. Eating oatmeal can also help decrease your cholesterol levels and reduce your risk of heart disease. 2. Grapefruit Studies indicate that eating grapefruit can reduce insulin levels. Lower insulin levels after meals can help your body process food more quickly and efficiently. This means that you burn more calories and store less fat. 3. Hot Peppers Adding some spice to your food can speed up your weight loss. Hot peppers, like jalapenos, contain a chemical called capsaicin, which gives these veggies their heat and causes a spike in your metabolism. This chemical also keeps the calorie burn going hours after you’ve finished your meal. 4. Lean Proteins The protein found in chicken, turkey and other lean meats takes a great deal of energy to break down. Therefore, your body burns a lot of calories during the digestive process. Protein is also an essential ingredient in building lean muscle mass, which burns more calories than fat. 5. Salmon and Tuna High levels of the hormone leptin have been linked to slower metabolisms and weight gain. A good way to lower leptin levels is to increase your intake of fish. The oil found in fish like salmon and tuna has been shown to cut leptin levels and help your body process foods more effectively. 6. Low-fat Yogurt Low-fat yogurt is one of the best foods to eat if you’re trying to lose weight and boost your metabolism. Yogurt is full of calcium and protein. It gives you the energy your body needs to keep going all day and helps you build lean muscle mass. Yogurt can also help regulate your digestive tract. 7. Green Tea The caffeine found in green tea accelerates your heart rate and speeds up your metabolism. The tea also contains a chemical, known as EGCG, that stimulates the nervous system and helps you to burn calories at a faster rate. 8. Broccoli Broccoli is rich in both calcium and vitamin C. These two vitamins work together to help you burn calories faster and more effectively. Calcium activates your metabolism, while vitamin C helps you absorb more calcium. 9. Almonds Almonds may be high in calories, but they are also jam packed with essential fatty acids which are great metabolism boosters. And the healthy fat in almonds has been proven to help in lowering cholesterol. 10. Apples,Pears, Berries: These fruits are low calorie, high fiber, and rich in vitamins and antioxidants. Your body must burn calories to break down. Since they help you stay full for longer, you‘ll eat less. And they are naturally sweet! Spices can fire up your metabolism too! In addition to some of the suggestions listed, certain spices such as chiles, cinnamon, curry and ginger fire up your central nervous system and can boost your metabolism by as much as 12%. Sleeping less than 6 hours a night. Eating empty calorie foods–exchange them for low carb, low-fat, high nutrition foods. Choosing processed foods–exchange them for whole grains, fruits and vegetables. And don’t overlook the power of water! Researchers in Germany found that subjects increased their metabolic rates (the rate at which calories are burned) by up to 30 percent after drinking approximately 17 ounces of water. Water is also a natural appetite suppressant that banishes bloat as it flushes out sodium and toxins. Drinking enough water will also help keep you from mistaking thirst for hunger. It is necessary to drink water at frequent intervals, because it is water that helps in digestion of food. So drink up! Make sure that you are starting your day with a big big glass of water and drink all day long. It’s hard to get too much water. Quick fixes don’t exist for long-term health. Slow and steady wins this race. We are creatures of habit. To make health-conscious changes, the changes have to fit in with our habits. Have you ever changed, or tried to change, the way you eat? While you may want to change your diet, it can feel too hard and time-consuming. And when you are busy with work, family…life, there is just no time for added complication, right? But, it’s the New Year and you are making a promise to start (and stay) on a strict diet to lose weight, but are you just setting yourself up for more frustration and failure…again? Shifting to healthier eating habits can seem complex. Nutritionists tell you, “Eat more vegetables; reduce your saturated fat; watch the sugar; buy organic; avoid trans fats; get enough calcium; eat low carb; high protein…” On and on it goes. Little wonder most people put off changing their diet…or opt for trendy rapid weight loss plans. You already know that commitment is crucial for success; so you consider one of the popular commercial diet programs that promise quick and easy results. This craving for instant gratification is why people gravitate to fad diets. Unfortunately, (and statistically); these plans don’t let you MAINTAIN weight loss. Once you “go off” the diet, and return to old ways, the bad habits return along with weight gain and associated health issues. But no need to feel discouraged. Small, incremental changes are the key to success. Health altering changes simply involve re-education to meal options that promote consistency while keeping your body filled with nutrition. It is more a mind-shift and a behavior change, not a diet. Learn to change the behavior you are used to and focus on building habits of living that improve your life. Shift your attitude to viewing food as a fuel to sustain life and not something that controls your quality of life. We all have different body compositions, likes and dislikes, and finding success in making healthy lifestyle changes is a process that will take a little time and experimentation. Start with small steps and before you know it, the small changes add up to become part of a healthy new lifestyle. For example, when you wake up tomorrow instead of skipping breakfast, eat a small meal consisting of healthy carbs, protein and a little fat. Do this for a week. Once this works for you with little effort, it will be time to make another small change. No matter what diet you follow, make sure most of it comes from food without bar codes. Whole foods, with minimal processing and preservatives are best. Concentrate most of your shopping time around the perimeter of your grocery store. Chances are the fresh produce, whole grain breads, meat and seafood departments, and dairy cases are around the perimeter of the store. Then dip into the isles for staples, like oatmeal and olive oil. And you don’t need nearly as many calories as you think you do. Most women will lose weight (or maintain it) on 1,250-1,600 calories and most men between 1,500-2,000. Cutting calories by about one-third is also one of the best strategies for living longer. Follow these eight rules of eating, and you’ll more easily manage your weight and improve your nutrition From YOU: The Owners Manual by RealAge experts Micael F. Roizen, MD and Mehmet C. Oz, MD. my energy and I had less to put into my training or more importantly … to my family, friends and work. —Today, I weigh 115 lbs and maintain a body fat of ~16%. Eating healthy is still a top priority in my life. I do not allow my diet to control me, although I am quite strict and careful about what I put into my body. .. but it is a process that still requires self control and discipline. And YES, I still carry my cooler with me almost everywhere I go… (Some habits never die!) These days however, I enjoy a variety of foods, and feel freedom to experiment with new recipes and ingredients without depriving my body of the nutrients it needs… or worrying that I may eat too many carbs or not enough protein at any given meal. I go to restaurants, and cook-outs and cocktail parties again. Yes, I know, this is NOT rocket science. But initially I was so worried about that damn scale. Just like SO MANY of us. Why do we so obsess over the scale? What exactly is “too much weight” … We need to stop focusing on the scale but on our own unique body composition. Today, I weigh more than I have in years, but I wear exactly the same size clothes, though I have stronger, more athletic physique. My body fat percentage is in the excellent range for someone who is almost 50 years old. My energy and my disposition are better than ever… I feel (and look) healthier than I have in a long time. (Most days) I am not obsessed by the mirror, or the scale. And as I get stronger and continue to build more muscle…. I continue to burn unwanted body fat. Yes, I’ve fallen to the dark side. And I’m all in. Some may even say I’m obsessed. Fitness Plateaus: How to get your body out of cruise control. Workout plateaus are nothing new. You are hitting the gym routinely. You feel more energetic and look better, but suddenly now you‘re not feeling the burn anymore. The scale stops moving and your body becomes immune to the stress of exercise. You have hit the wall. Fortunately, it usually only takes a few changes to overcome a workout plateau. The key to overcoming plateaus is change. Changing up just a few things can make a big difference. Our bodies are highly adaptive and are constantly working to maintain homeostasis—so the workout that was so challenging and making you sweat and burn calories 6 weeks ago is no longer. Changing your approach or routine will help you blast through frustrating plateaus. Remember the body acclimates to repeated challenges, making it necessary to make changes every four to six weeks. Change workout activities, intensity and break through plateaus. post-exercise metabolic rate and fat loss will increase much more than if you exercised 40 minutes steadily at an average pace, and you’re also building lean muscle mass. Shake it up. Walking doesn’t do much to help you lose weight, even though it’s good for your health. Instead, mix up your cardio intervals by throwing in new things every week: the elliptical machine, the recumbent bike, the rowing machine, the stair climber. Keep your body guessing. Start it up. The one time when simple aerobic exercise can really boost your metabolism is in the morning. When you first wake up, your liver has burned through your carbohydrate stores, and light aerobic exercise can jump-start the fat-burning enzymes in your liver. So start your day with a brisk walk. Count it up. You might think you’re not snacking between meals, but it’s easy to miss the bites of your kids’ leftovers you take here and there. For a few days, record everything you eat. Make sure the extra food you take in is accounted for — either by cutting out your dinner roll or by doing an extra high-intensity interval. *Varying your activities or cross-training is important to avoid or break through plateaus. But while changing up type of activity is important, it is also important to implement variations in intensity. Specify different days of the week as low, moderate or high-intensity days. Grab a new partner to work out with. Get out of the gym and move your workout outdoors. The mix-up of activities will also keep your workouts enjoyable, thus helping with motivation as you break through the wall. And if you’re not strength training, now is the time to start. A pound of muscle burns more calories than a pound of fat. And you want to replace fat with muscle to increase the amount of calories you burn a day. If you are already lifting and have hit your plateau: You MUST step up the intensity of your strength training program. Bump up the frequency of your training from twice to three times a week. Increase the amount of weight you’re lifting to challenge your muscles even more or try a more challenging exercises. But plateaus do not necessarily mean you need to work harder or spend more days at the gym. It may be time for an active rest. Proper rest and recovery from working out is so important, it may just be the deciding force behind results and no results. Consider taking a few days, to up to a week off from structured exercise, and instead take leisurely walks, play ball with the kids, or take a yoga class. Active rest rejuvenates the mind and the body and allows for overworked muscles to rest and rebuild. You will return to exercise stronger and ready for new challenges.